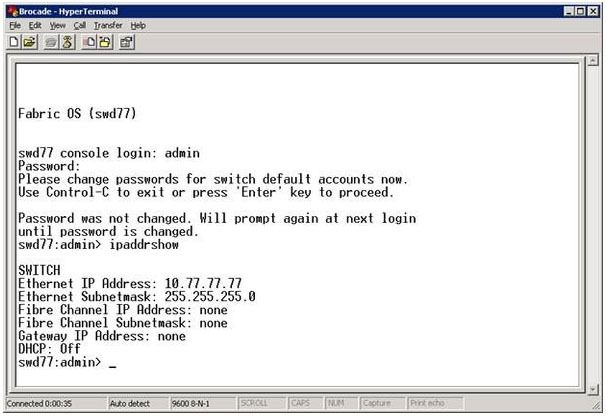 Recently, we had one of our customers call us with an interesting problem configuring their Brocade 12000 Director. 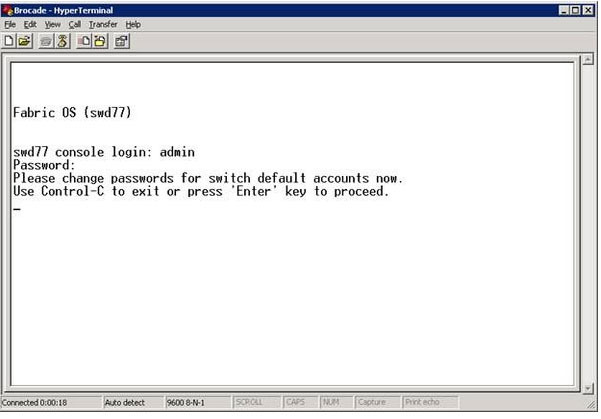 They needed to perform a change on their gateway but using the web GUI would force a reboot on the entire director, which was out of question at the time. I threw out a few ideas and decided to try the CLI via the serial port. I didn’t have a Brocade 12000 Director in my lab but I did have a newer DS-4100B fibre switch. I got my laptop out and setup the switch for the test. After a few minutes wasted resetting the password back to default (I hate when I forget passwords on things!) I was into the CLI. Then press Control-C since this is a test box and security is not a concern. Using the “ipaddrshow” command we can make the needed adjustment. These are the defaulted settings for the switch. It will go one by one, allowing you to make any changes. I entered through until “Gateway IP Address:” came up, entered in the desired Gateway IP and entered through the rest. The switch didn’t require a full system reboot and it was finished making the adjustment in a few short seconds. If you need assistance with any of your Brocade Switches or Directors, don’t hesitate to give us a call at (952)314-5905.